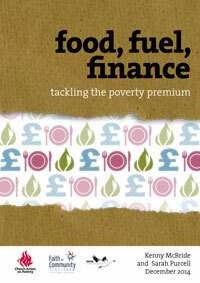 This Monday (8 December), we launched our new report Food, Fuel, Finance at an event in Glasgow. The report gives an overview of how the ‘Poverty Premium’ affects people’s lives, and recommends action which could be taken to tackle this injustice, by the governments in Westminster and Edinburgh. The report (click here to download it) draws on a year of grassroots research we conducted in Glasgow, with funding and support from the Iona Community, Faith in Community Scotland, the Church of Scotland, the Scottish Episcopal Church, and Christian Aid Scotland. We listened to many people affected by the ‘Poverty Premium’ – unfairly high prices for everyday essentials including food, fuel, finance, furniture, and even funerals. Food, Fuel, Finance tells the stories of how communities across Scotland – and elsewhere in the UK – are tackling the problem themselves through creative initiatives such as food hubs, community gardens and shops, and district heating schemes. But the report also highlights the need for regulation and legislation, and calls on the Scottish and UK governments to develop plans for tackling the Poverty Premium in partnership with communities. We’re now making plans to pilot some of the creative new ideas from the report in communities across the UK. Meanwhile, Church Action on Poverty’s supporters have already sent over 600 messages to the ministers at Westminster and Holyrood who have the power to establish a strategy for tackling the Poverty Premium. If you’d like to add your voice to the campaign, you can use our e-action here. The very same day that we were launching Food, Fuel, Finance in Glasgow, the All Party Parliamentary Group on Food Poverty were launching their own report in London. Feeding Britain refers to the Poverty Premium as one of the driving factors in the demand for food aid. Click here to read our reaction to it. This entry was posted in Churches, Close the Gap, Fair Prices, Food Fuel Finance, Food poverty, Fuel poverty, Funeral poverty, Partners and allies, Poverty Premium by Church Action on Poverty. Bookmark the permalink.